Several fishing magazines have published short stories about the Belize mothership adventure. Below are the full-length feature articles we are aware of t hat have been published in English (two european magazines have published feature articles in other languages). 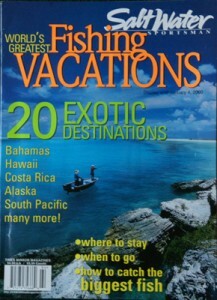 * Saltwater Sportsman, an international monthly magazine, published a special edition titled “World’s Greatest Fishing Vacations” (cover at right) and featured as one of it’s twenty destinations the Belize mothership trip. Unfortunately, no digital versions of the article are available.